There’s no denying that a company’s reputation has always been important. In the past, however, a company may or may not prioritize reputation management. Many companies hired PR firms to take care of public perception. In this digital age, reputation has become increasingly critical and permanent, meaning that companies can no longer opt out. Before the digital age, word-of-mouth recommendations were the primary source of rating a company’s stature, distinction, trustworthiness and reliability. Today, online reviews and recommendations rule. As people continue to place more and more trust in search results, the importance of reputation management (maintaining and managing our online reputation) grows. Consumers are equipped with a broad range of tools for controlling the public’s perception of businesses. Think reviews, comments, reactions, photos, posts and tweets as some of the more popular modern-day word-of-mouth “vehicles”. Moreover, this consumer-generated content also helps shape search results (as do the myriad of sites that collect and curate reviews). Search results contain a five-star rating system to profile public opinion for all to see. If a Google user clicks on a result, he or she will often be directed to an expanded panel called a Knowledge Graph (we’ll talk more about these in a later Belgrave Brief). Knowledge Graphs feature the number of reviews, the exact review text and the number of stars each reviewer awarded a business. A “Write a Review” button is front and center along with the options “Ask a Question” and “Suggest an Edit,” encouraging more feedback and engagement. As a business owner, you have no direct control, so what do you do? First and foremost, engage your users in social media. To do so, create and post valuable content, and make sure to reply to negative reviews. Be authentic when you respond and demonstrate that you care. And don’t forget to thank the people who say nice things about your business. If you have a Gmail account, use Google My Business to ensure that, among other things, 1) your company is properly published with the correct address for mapping and 2) your regular business hours as well as holiday hours are up-to-date. The amount of information you provide is up to you and your time constraints. You can manage your Google reviews from here too. Periodically (as often as you can) check your reviews on Google, Facebook, Yelp and whatever other sites your customers use to talk about you. Reply if you can, and as promptly as possible, to mitigate any negatives and show that you’re willing to resolve any problem. Timing and kindness are key. Online venues are always changing, and it’s important to keep up. Facebook recently announced they were changing from a star system (1-5 stars) to a Yes/No recommendation system. Now you have to look at the text of the feedback to get the true story. 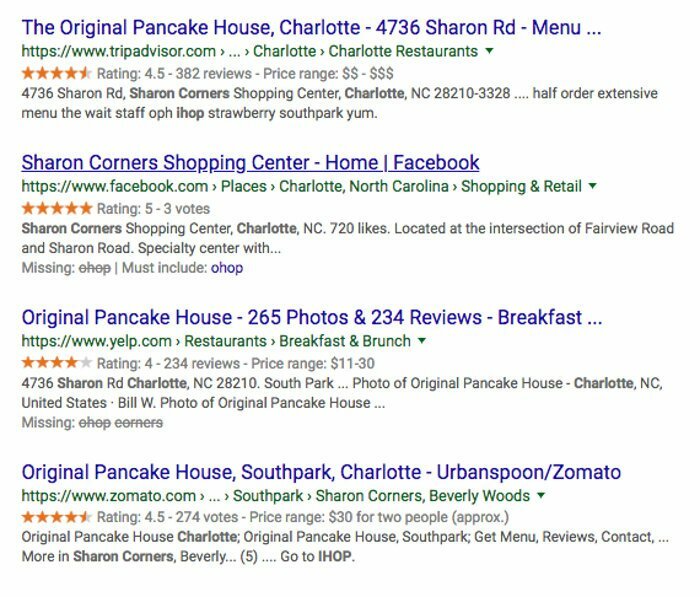 Here’s an example of how reputation appears in search results, using “The Original Pancake House” in Sharon Corners Shopping Center as an example. The orange star rating is based on a scale of 1-5, with a 5 being the best. Reputation management is not something that your company should take lightly. If you need help, please consult our team. We can develop a custom solution for your business to help you protect yourself during this ever-changing digital age.